It must be the primal, hunter-gatherer part of our brain that makes people so wild (so to speak) this time of year. 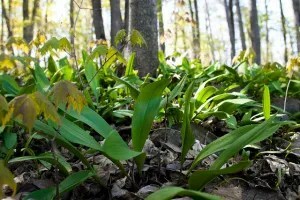 Now that it’s April, it’s ramp season in Appalachia, and rural people throughout West Virginia and nearby states will be scouring the hillsides, often in large groups, digging up clumps of smelly, leafy bulbs. 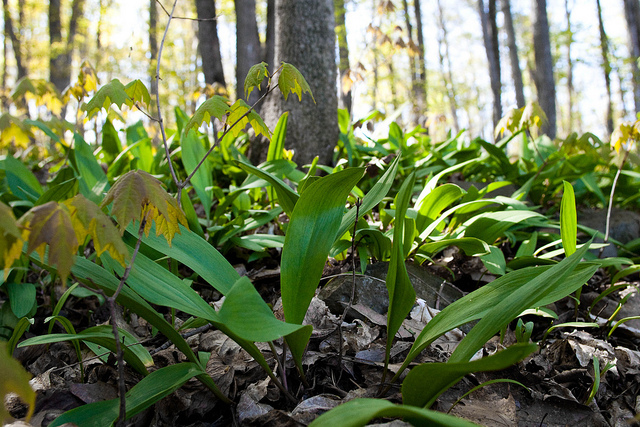 Ramps (Allium tricoccum) are wild leeks with tasty leaves and a small, but pungent, bulb, that grow in moist shady areas throughout Appalachia. While rural towns celebrate with ramp festivals and fry their ramps with potatoes and ham, urban residents enjoy theirs in fancy restaurants in a lovely salad or pasta with a sprinkle of asiago cheese and perhaps a dry white. I confess that, although I now live in West Virginia, my location in the relatively cosmopolitan Eastern Panhandle means that I get my ramps the white tablecloth way. But the thrill is still there: it’s not just about the taste. It’s that it’s wild. There’s just something satisfying about eating something that comes off the land. Surely our evolutionary memory kicks in and positive neurons fire when we bend over to collect our food from the ground instead of the frozen food case. After all, this is the way it’s supposed to be, right? Humans evolved as hunter-gatherers, collecting their sustenance from the environment around them. A good food source meant survival – the ultimate satisfaction. I get a similar reaction picking vegetables from my garden, but for some reason there’s an added thrill when food is foraged. Perhaps it’s the reassurance that Earth’s bounty isn’t really dependent on us; rather, sometimes it’s just there for the taking. And ramps are almost always taken, not farmed. I may not pick them myself, but I know that someone did. Of course all food at some point originally came from the land, before it ended up in a package on the supermarket shelf. But most of the time we’re so removed from this process that the origins of our food are more than a mystery; they’re almost unreal. We can get whatever we want, whenever we want, regardless of the season. Familiarity may not breed contempt, but it can diminish passion. 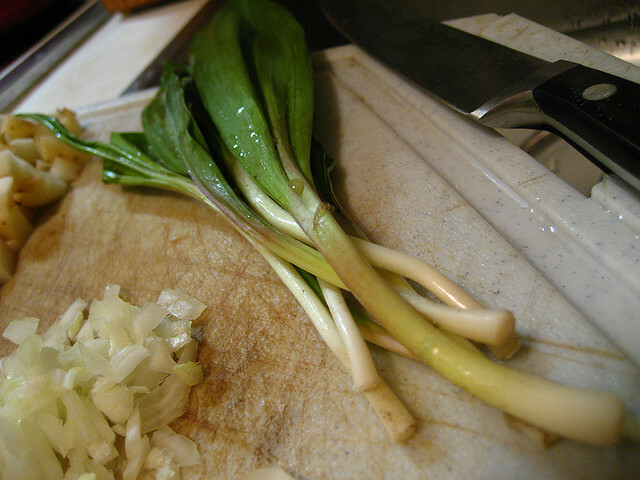 With ramps, now matters. They’re underground all winter, and their youthful flavor will be gone by summer and fall. That’s a pretty good definition of a treat: something good that you can’t get all the time. Writer Barbara Kingsolver captured this idea in her 2007 book Animal, Vegetable, Miracle, in which she writes about her family’s effort to live for one full year eating only locally produced (by definition, in season) food. She opens her story in early spring in the mountains of Virginia, herding her skeptical family through the local farmers’ market after a cold dark winter, searching desperately for local replacements for California cucumbers and Florida fruit. “She’ll never do it,” I thought as I read it. “I know this region, and I can’t imagine finding enough to eat locally in early spring.” But she did, with baby lettuce for salad and rhubarb for her daughter’s daily fruit fix. She writes about how much more her family enjoyed each new food that year as it came into season, knowing it wouldn’t be there forever but looking forward to whatever came next. The following year they were better prepared, after gardening and canning (and slaughtering) food they had raised themselves the previous summer and fall. I won’t pretend to go that far. But our local farmers’ market does open this weekend, the first Sunday in April. We’ll get our fresh greens, spring onions, and chemical-free meat and eggs. If we’re lucky, we might find some fresh bread and maybe some leftover honey from last year. We’ll talk with the farmers we now know so well, and they’ll share a few stories about coaxing food from the ground and from their stock. It’s not wild, but that’s okay. It’s a way to connect with what sustains us. I don’t need to know the details, I just need to know they do it. From the land.